This image is from Henry D. Butler’s 1858 book, The Family Aquarium, one of the first step-by-step guides to maintaining a home aquarium. Home aquariums were the newest fad in the natural history-crazed Victorian era. Philip Henry Gosse wrote about it in the Atlantic Monthly. 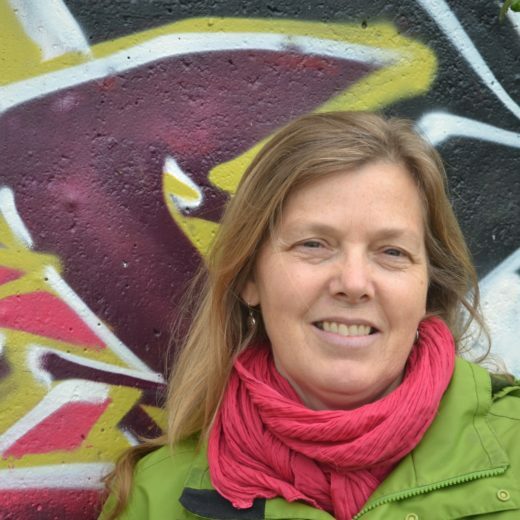 About Salvaged: In this column we republish articles that help us look at the world in a new way. While not necessarily the first time an idea or point of view found print, these articles helped shed new light on coastal science or societies. Other than slight editing for punctuation, the text for “My Aquarium” has been preserved as it was first published. In the grand homes of the gentlefolk of the Victorian era, there was a lot of dead stuff: butterflies in frames, pictures composed of tiny shells, plants pressed in tissue, cabinets of insects and fossils and birds’ eggs, even fantastical taxidermy tableaux (kitten wedding, anyone?) Advances in glass technology played a big part in this natural history craze, with everything from magnifying glasses and conservatories to picture frames and glass cloches enabling the trend. But glass also allowed people to have live displays in their home, first with terrariums and then, in the mid-1800s, aquariums. In this 1858 essay, “My Aquarium,” Philip Henry Gosse details his heroic efforts to display the ocean in a glass tank he called an aquarium. (According to Bernd Brunner, author of The Ocean at Home, Gosse was the first to use the word aquarium.) Gosse, the archetypical gentleman scientist, adhered to the philosophy of natural theology—essentially seeing the glory of God in the natural phenomena around him. His writing is quirky and hyperbolic with religious undertones, all slathered with a large dollop of anthropomorphism, but it is also thoroughly charming and full of detailed observations as he comes to terms with trying to keep the organisms—his “fifty lively denizens … who come at the daily roll-call”—alive. It was no easy task; Gosse was inventing the home aquarium. In his experiment, Gosse tackled the challenges of a toxic varnish, low oxygen, putrefied creatures, “vexatious greenness,” and more. In the end, with a lot of careful tending and having emptied, cleaned, and refilled his tank several times, Gosse’s experiment was successful. He then invites his dear readers to meet his friends: “Come with me and I will introduce them to you. A fig for scientific nomenclature! You shall know them by their household names.” Indeed, tales of Amphitrite, Micawber, Crazy Kate, Topsy, and Giant Grim await. Even if you’re not an aquarist, we highly recommend giving Gosse a read. Perhaps read it out loud. In your best British accent. With a tot or three of sherry. On the tenth of May 1857, I became the glad possessor of a tank capable of holding thirteen or fourteen gallons of water. Its substantial frame of well-seasoned oak, its stout plank bottom, lavishly covered with cement, promised to resist alike the heat and dryness from without and the wet within. The sides and ends, of double flint-glass, seemed to invite the eye across their clearness. Its chosen site was at a south window, so shaded by a wing of the house as to receive only the morning sun for about two hours; and clustering vines overhung the window, so that the beams fell in checkered light. All was now ready. A few fragments of white quartz were arranged in rude imitation of ocean recesses, and in their fissures were placed four or five small plants of Enteromorpha and Corallina. Sand was strewn upon the bottom, to the depth of two inches, and ten gallons of sea-water were then poured in. This had been brought from one of the wharves, at high tide, twenty-four hours previously, and twice drawn off with a siphon—each time after twelve hours’ rest. It was not, however, perfectly translucent, and at the end of a week was still cloudy. On the fifth day after the tank was filled, I began to introduce the animals to their future home. Ten Buccina were first put in possession, in the hope that they would perform the part of gardeners to the young plants. On the sixth day, seven Actiniæ were disposed upon the rock-work. On the seventh, a Horsefoot (or, as our Southern neighbors call it, a King-Crab, though of most unregal aspect) was allowed to make his burrow in the sand. On the eighth day, four Hermit and Soldier Crabs and two Sand-Crabs were invited to choose their several retreats. On the ninth, three fine Sticklebacks and three Minnows were made free of the mimic ocean; and on the tenth, an Eel and two Prawns. All seemed well until the evening of the twelfth day, when a small white cloud was seen rising from the bottom. The spot was searched for some dead member of the new colony; but none was found, either there, or in any other part of the tank. Supposing that the impure gas might be generated by the decay of minute creatures congregated in the cloudy corner, a lump of charcoal was tied to a stone and sunk upon the spot. Next morning, the cloud had cleared from around the charcoal, but slender wreaths of similar appearance were rapidly rising from the sand in every other part of the Aquarium. The fishes came oftener to the surface than they were wont, and all the animals had lost vigor. Aëration was resorted to, which was performed by dipping up the water, and pouring it back in a thin stream from a height of several feet, continuing the operation for ten minutes. This was repeated four or five times during the day, and at night more charcoal was added. Some of the pieces were sunk to the bottom, and others were suspended at different depths in the water. Two or three days passed in this way—the putrescence kept in check by the means used, but not entirely overcome. Meantime, though none of the stock had died, there was less vitality than at first; especially each morning, after seven or eight hours unaided by aëration. Tired of what seemed an ineffectual struggle, I determined to leave the Aquarium untouched for a day, and await the result. Accordingly, the charcoal was withdrawn and aëration discontinued. The milky cloud increased in density, and the whole mass of water became turbid. The fishes kept constantly near the surface, swam languidly, and snatched mouthfuls of atmospheric air. The Eel became bloodshot about the gills, and, writhing, gasped for breath. The Soldier-Crabs hung listlessly from their shells, and no longer went about in quest of food. Even the Actiniæ shrunk to half their former size; and the Buccina, crawling above the water, ranged themselves in a row upon the dry glass. Disappointed, but not discouraged, I filled several shallow pans with pure sea-water, clean sand, and fresh plants, and transferred to them my suffering and wellnigh exhausted animals. A day restored them to their normal condition, and now I was ready to begin my Aquarium anew. But to what purpose should I begin anew? Would there not be the same failure? What had been wrong? At least two great faults were evident. First, in order to guard against the possibility of a leak, the bottom and posts of the tank had been covered with many coats of an alcoholic varnish. Now it was probable that time enough had not elapsed between the several applications for the thorough evaporation of the alcohol. Might not its gradual infusion in the water have caused the death of the animalcula in such numbers as to taint the whole by their decay? The second fault was, strewing upon the surface of the sand a handful or two of white powdered quartz, which, from having been pulverized in an iron mortar, was so oxydized as to turn a deep yellow. This might have poisoned the animalcula. The first fault seemed to me the chief, but I proceeded to remedy both. The whole contents of the tank being removed, it was thoroughly washed on the inside, exposed for several days to the sun and air, and then soaked for twelve hours in clean sea-water. This being thrown away, the stones, scalded and well-washed, were restored, and clean sand, replaced the old. Water was drawn from the dock at high tide; but it was less clear now, on the fourth of June, than that which had been got early in May. This surprised me not a little; for, as I stood upon the wharf and looked down into it just before sunset on the previous evening, I was struck with its beautiful limpidity. Curious to see if its aspect remained unaltered, I went to the same spot where I had stood the night before. The tide was at the same height, but twelve hours had made a marvellous change in the appearance of the water. Its sparkling clearness had given way to greenness and turbidity, and no object could be seen a foot below the surface. No storm had stirred its depths during the night—why this change? Conjecture was of no practical utility, and I returned home satisfied that my fifteen gallons of water were as clear as any it was then in my power to obtain. Covering the tub from the dust, I left it to settle until sunset. Then the ever-useful siphon drew off two thirds of it tolerably clear, leaving a thick green deposit upon the sides and bottom of the vessel. Next day, it was again drawn off from the sediment, (at this time, small in quantity,) and poured into the tank. Several newly obtained plants of well-growing Enteromorpha and Corallina were arranged among the stones, and the Aquarium was left at rest. Gradually the water became nearly clear, but not perfectly so until after the introduction of animals. Eight days after it was filled, the Actiniæ were put in; on the ninth, several small Mollusks; on the tenth, Crustacea; and on the eleventh and twelfth, other varieties of the same types; but not until the fourteenth day were fishes ventured upon. Day by day the water grew clearer and clearer, until, at the end of three weeks, it was beautifully translucent. Three more weeks passed, during which the beauty of the Aquarium was much heightened by a luxuriant growth of Confervæ mingled with Enteromorpha, which together covered all those parts of the stones which received a direct light. The mimic rocks seemed draped in green velvet, and in the sunlight were studded with pearly bubbles. There was, however, one blemish: the hungry crabs had so nibbled the larger plants that it was deemed necessary to renew them, in order to secure a sufficient supply of food and oxygen. Accordingly, a fine specimen of Enteromorpha was added. It consisted of five or six delicate fronds about five inches in length, and these soon increased to treble their original number and twice their original size. At the end of about two weeks, they suddenly became covered with a dull bluish mould, at the same time ceasing to give out bubbles; and the whole plant, instead of rising to the surface of the water as hitherto, hung limp from the fissure where it was placed, and trailed upon the sand. Coincidently, (was it consequently?) a greenish tinge pervaded the water, speedily increasing in depth and opacity. In five days, no object could be discerned six inches from the glass, and my beautiful Aquarium was transformed to an unsightly ditch. Yet the water was apparently pure, and the activity of its inhabitants was in no wise lessened. What was this vexatious greenness? Was it animal or vegetable? Was it the diffused spores of the perfected Enteromorpha or of the rank Confervæ upon the stones? If neither, what was its cause? Excess of light was the most obvious suggestion; and so it was supposed that its exclusion might be a potent remedy. Therefore a double curtain of glazed muslin was stretched across the window; and the tank, both top and sides, wrapped in folds of paper. A week of darkness changed the deep green to a dingy olive. But the experiment could not be continued. The nightly admission of air by lifting the paper covering was insufficient to maintain the imprisoned creatures. They were happy, though captive, while in a mimic ocean, but miserable in a dark dungeon. Languid and spiritless, they lay supine, or crawled listlessly and aimlessly about. This would not do, and so light was again admitted freely to all but one side of the tank; there, a screen of yellow paper intercepted the direct rays of the sun, while upon the top they fell through the foliage of a Clematis vine. Three weeks more wrought a slight change for the better; but it was too slight and too slow for my patience, or that of curious friends waiting to see my Aquarium. The second experiment had failed, and so once more the tank was emptied. Two or three animals only had died; all the others gave evidence of health. Again they were removed to other vessels, and again I began anew. Clean sand, clean stones, water drawn at high tide and carefully decanted, three small plants of Ulva latissima, with one clump of Corallina officinalis, made up the contents of the tank, when, on the tenth of August, it was the third time filled. A sheet of yellow paper was placed between the tank and the window, and it was left three days at rest. 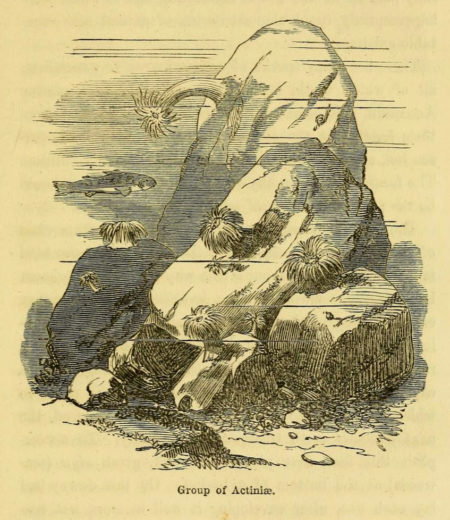 At the end of that time, the water, which was beautifully clear when introduced, had grown a little hazy, and, as the sunbeams fell aslant it, the unaided eye could perceive a multitude of minute whitish creatures darting forward and backward like a swarm of bees. Then five Actiniæ were laid upon the rocks, to which they at once adhered, spreading out their restless tentacles in busy seizure of the tiny prey. In a week more the foggy appearance had ceased; but the clearness of the water was marred by the slimy exudations from the Actiniæ. Knowing that this matter was eaten by some of the Crustacea, five or six small Soldier-Crabs were dropped in, which faithfully performed their allotted labor. From this time, animals were added daily, until they had reached to thirty in number. On the fifteenth of September, a fine specimen of brown Chondrus crispus was added, and on the thirtieth, a very large frond of Ulva latissima. A great portion of the Chondrus decayed at its junction with the shell on which it grew, and fell off; but the Ulva increased much in size, as well as in depth of color and firmness of texture. And now months have gone by, and at last my Aquarium is successful. Fifty lively denizens now sport in the crystalline water and come at the daily roll-call. Come with me and I will introduce them to you. A fig for scientific nomenclature! You shall know them by their household names. This Bernhard Crab in the front, so leisurely pushing away the sand before him with his broad, flat claws, quietly enjoys the meal he finds, undisturbed by fears of a failing supply. There is less of enterprise than complacency in his character, and I call him Micawber, for he is always expecting “something to turn up.” Twice since March has he changed his coat, and thrown off his tight boots and gloves for new ones. The disrobing seemed to give him little trouble, though he sat dozing at the door of his cell some hours after, as though fatigued by the unusual effort. Very becoming is the new costume; and the red coat is prettily relieved by the gray tint of his Diogenes-like dwelling. There goes a military cousin of his, striding along, with his heavy armor clattering against the glass as he walks. A pugnacious fellow is that same soldier; and if he meet an opponent, you may see the tug of war. Should he chance to prefer the other’s shield to his own, he will seize him in his burly arms, and shake him from under its protection. Yet he is cautious withal; for though obliged to doff his own armor before he can try that of his denuded foe, he retains hold of both until satisfied with the trial. If he like the new mail, he will march off with it; if not, he will array himself in his own again. Meanwhile the vanquished combatant waits tremblingly the result of the examination, glad to get possession of the rejected defence, be it which it may. Yon dark little crab, with the bulky claws so gayly mottled with yellow and black, lurks in that hole at the base of the cliff nearly all day long. His name is ’Possum; for at the slightest sign of danger he doubles up his claws like a dead spider, and lies in feigned lifelessness. Speaking of spiders—here are two Spider-Crabs, the very monkeys of this aqueous menagerie. The small one climbing the post is Topsy. There she is, sliding down again, and with headlong pace is now scampering over yon yielding Anemone. Heedless of its hundred arms, so generally dreaded and avoided, she jumps this way and that across its wide mouth; and now, seated on its back, she snatches morsels from its shrinking side. Now look at her sister sprite, Crazy Kate. Her head adorned with a long plume of Coralline, she is tearing ribbon-like shreds from the silky lettuce and hanging them upon her already fantastic person. Anon she dances in mad glee, and next her arms are solemnly stretched upward in grotesque similitude to one in prayer. When she is hungry, she will, one by one, take off those weedy trophies from her back and feed upon them. Why do you start? That is not a sea-serpent winding from under the arch, but only an innocent Eel. Yet innocent and tiny though it be, there is something frightful about it. Its fixed, staring eye, its snake-like stealthiness, bid you be on your guard. Sometimes it rises behind that bushy Carrageen, and with high uplifted head peers over at me in such a way that I am half afraid; it is so like the old pictures of Satan tempting Eve. Would you like to see an Actinia eat? I will drop a bit of raw oyster upon its outspread disk. See with what eager start it closes its fingers about the dainty viand, passing it along slowly, but surely, to its now gaping mouth, while every nerve is vibrating with the anticipated pleasure of the feast! That milk-white one is my favorite, and I call it Una. Seated in modest contentment on that brown-stone seat, she upturns her pure face to the mild light of evening; but folds her arms, and bows her head, and veils herself, when the noon-day sun gazes too ardently upon her. This one in the rich salmon-colored robe has all our national propensity for travelling. Wandering restlessly about, she never remains two days on the same spot. Yesterday, she climbed the cliff, and sat looking off upon the water nearly all day long. To-day, she has come down to the sand, where, with base distended, as if in caricature of crinoline, she perambulates the crowded thoroughfare. Here is a semi-twin, one base and two trunks. Shall I call it Janus, for its two faces? or will Chang-and-Eng best distinguish this dual unit? Sometimes, one, with tentacles in-tucked and mouth sealed, seems dozing; while his waking brother is busily waving his arms for food. At another time, you may see them both folded together in sleep, like the Babes in the Woods all bestrewn with leaves. Ah, you should have seen my Amphitrite! She bore her plumy crown so grandly, you would have said she was indeed the queen of Actiniæ. But, alas! she could not brook imprisonment, and, pining for the unwalled grottoes of Poseidon, she drooped and died. Behind that sheltering rock, and overhung with sea-weed, there is a dark, deep cave, the chosen abode of Giant Grim. Push one of those soldiers to the mouth of the den and wait the result. At the first movement made by the unwitting trespasser on guarded ground, two long, flexile rods are thrust out, reconnoitering right and left. Two huge claws follow, lighted up by two great glaring eyes. At last the whole creature emerges, seizes the intruder, and bears him swiftly away, far beyond his jealously kept premises. With dogged mien he stalks gravely back to his stronghold. You exclaim, “It is a Lobster!” A lobster truly; but saw you ever a lobster with such presence before? Does he resemble the poor bewildered crustaceans you have seen bunched together at a fish-stall? Bears he any likeness to the innocent-looking edibles you have seen lying on a dish, by boiling turned, like the morn, from black to red? Those ghost-like Prawns are near relatives of the giant. See them, gliding so gracefully from under the arch, disappearing under the waving Ulva, and floating into sight again from behind the cliff. At night, if you look at them athwart a lighted candle, their eyes are seen to glow like living rubies. As they row silently and swiftly towards you, you might fancy each a fairy gondola, with gem-lighted prow. A quick dashing startles you, and you see a Scallop rising to the top of the water with zigzag jerks, and immediately sinking to the sand again, on the side opposite that whence it started. There it rests with expanded branchiæ and moving cilia; a rude passer-by jostles it, and with startled sensitiveness it shrinks from the outer world and hides behind a stony mask. The small, greenish, rough-coated creature, so like a flattened burr, is an Echinus. It is hardly domiciliated, being a new-comer, and creeps restlessly across the glass. Under this sand-mound some one lies self-buried—not dead, but only hiding from the crowd in this bustling watering-place. He must learn that there is no lasting retirement in Newport; so tap with a stick at his lodging. 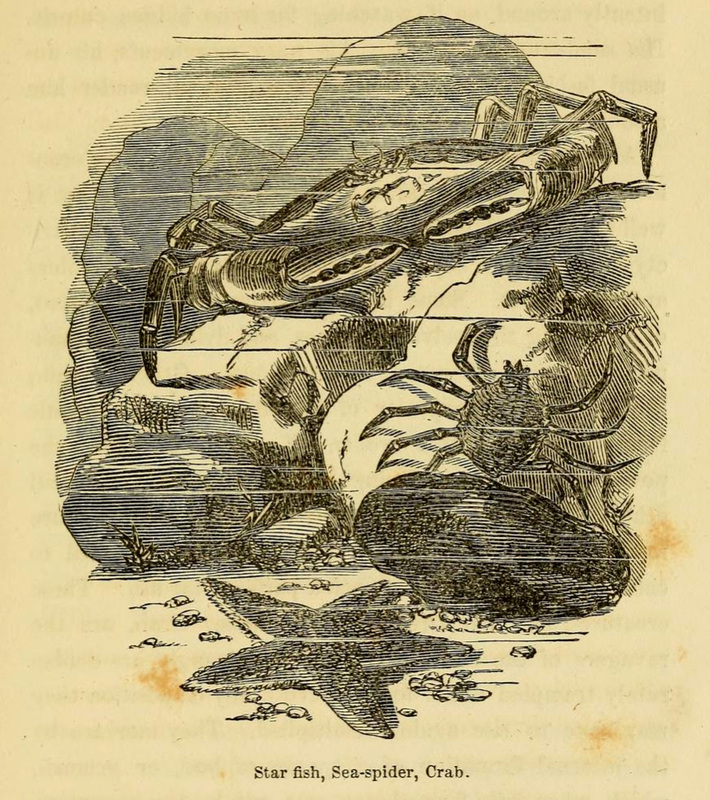 With anger vexed, forth rushes the Swimming-Crab and dashes away from the unwelcome visitor. As if he knew a bore to be the most persistent of hunters, he plies his paddles with rapid beat until far from his invaded chamber. His swimming is more like the fluttering of a butterfly than the steady poise of a fish. Pretty as is his variegated coat by day, it is far more beautiful by night; then his limbs shine with metallic lustre, and every joint seems tinged with molten gold. I could spend the day in showing you my Aquarium—the merry antics of the blithe Minnows; the slow wheeling of the less vivacious Sticklebacks; the beautiful siphon of the Quahaug and the Clam; the starry disk of the Serpula; the snug tent of the Limpet; the lithe proboscis of the busy Buccinum; the erect and rapid march of his little flesh-tinted cousin; the slow Horsefoot, balancing his huge umbrella as he goes; the——But I cannot name them all. Neither could you learn to know them at a single visit. Come and sit by this indoor sea, day by day, and learn to love its people. Many a lesson for good have they taught me. When weary and disheartened, the patient perseverance of these undoubting beings has given me new impulses upward and onward. Remembering that their sole guide is instinct, while mine is the voice behind me, “This is the way,” I have risen with new resolve to walk therein. Seeing the blind persistency with which some straying zoöphyte has refused to follow other counsel than its own, I have learned that self-reliance and strength of will are not, in higher natures, virtues for gratulation, but, if unsanctified, faults to blush for. Finding each creature here so fitted with organs and instincts for the life it was meant to lead, I have considered that to me also is given all that I ought to wish, more than I have ever rightly used. New evidences are here disclosed to me of God’s care for his creation, deepening my faith in the fact that he is not merely the great First Cause, but still the watchful Father. New revelations teach me of his sympathy in our joys, as well as of his care for our necessities. The Maker’s love of the beautiful fills me with gladness, and I catch new glimpses of those boundless regions where the perfection of his conceptions has never been marred by sin; and where each of us who may attain thereto shall find a fitting sphere for every energy, an answering joy for every pure aspiration. Cite this Article: Adrienne Mason “An Ocean in the Parlor,” Hakai Magazine, Mar 24, 2017, accessed April 26th, 2019, https://www.hakaimagazine.com/features/ocean-parlor/. Dutch fisherman Adriaen Coenen’s visual masterpiece chronicled the ocean’s denizens, real and imagined. All those strange sea monster sightings in days of yore? This may be the best explanation yet.